When approaching a sacred Buddhist site, it is customary to circumambulate three times before entering. You simply walk around the building, circling clockwise. Upon completion of the third loop, you enter. The first time I did this, I thought, why can’t I just walk in? But as I walked, I noticed the colors in the tiles that edged the walkway. I saw how the light reflected on various parts of the structure and not on others. I felt the quality of the air, which in this case was cool and crisp. I detected the scent of pine in the air and felt serenaded by chickadees. (I think they were chickadees.) Each time I circled, I saw or felt something I hadn’t previously. 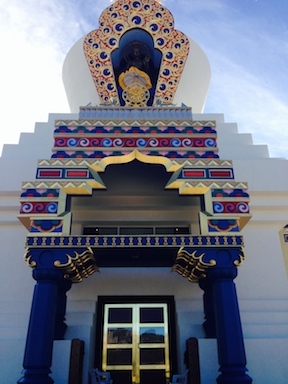 By the time I entered the front door (in this case, of the Great Stupa of Dharmakaya which Liberates Upon Seeing), I had a relationship to the building. My sense perceptions were open so I was able to actually BE in that particular space rather than in my ideas about what that space would be like. Noticing how you approach before entering a building, initiating a conversation, or even sitting down at your desk creates a gateway. We in the west are taught to dispense with formalities and get right to the point. Sometimes that is fine. But often we miss the way in completely. Oh, thank you for this. I have recently come to feel that entries and transitions are important, but I haven’t been doing very well at grasping how to treat them. You’ve given me an idea (the tradition) and also reminded me that it starts with noticing. I can do that, and see what I see. Firstly, a beautiful building. The details are absolutely amazing. I still remember the first time i saw The Stupa, it was during a hike with my former partner, and this building completely took me by surprise during the hike, which was/is wonderful. The second walk up was with Acharya Dale Asrael, AND my dathun family, after a two week meditation retreat and before i took my bodhisattva vow; twas energetic and profound. Have you seen the ceiling in the main shrine room? I later learnt the story of the pomegranates & The Vidyadhara. The way i entered was a little different and no different. Greg, did give us a tour and to hear of the work required to build this building is touching & moving. Compassion contains fundamental fearlessness, fearlessness without hesitation. There is a great feeling of warmth which gives rise to an attitude of openness and welcoming.